This study comprehensively investigates the molecular structure impact on SOA formation during the photooxidation of aromatic hydrocarbons under low-NOx conditions by simultaneously analyzing SOA yield, chemical composition and physical properties. The result suggests that the substitute location, carbon chain length and branching structure exert greater impact on SOA formation than the substitute number. This study improve the understanding of SOA formation from anthropogenic sources. This laboratory study was performed on re-suspended dust samples collected from several known dust sources of the world. We measured dust by multiple analytical techniques to understand their physical and chemical characteristics. Studies of the properties of dust are necessary to assess the magnitude of the growing dust problem, identify sources of dust, and, where feasible, apply preventative measures and remediation practices. Results can be used in global climate and health studies. A global atmosphere model with explicit representation of aerosol processes is used to assess uncertainties in the climate impact of ocean DMS efflux and the role of spatial and temporal variability of the DMS flux in the effect on climate. The radiative effect of sulfate is nearly linearly related to global total DMS flux. Removing the spatial or temporal variability of DMS flux changes the global radiation budget, but the effect is of second-order importance relative to the global mean flux. Downward transport of ozone from the stratosphere has large impacts on surface concentration and needs to be properly represented in regional models. This study developed a seasonally and spatially varying PV-based function from an investigation of the relationship between PV and O3. The implementation of the new function significantly improves the model's performance in O3 simulation, which enables a more accurate simulation of the vertical distribution of O3 across the Northern Hemisphere. This study was conducted to understand the influence of the ocean on the lifetime of atmospheric carbon tetrachloride, a strong, ozone-depleting gas. Data from 16 research cruises conducted between 1987 and 2010 show that, unlike the unreactive chlorofluorocarbons, carbon tetrachloride is undersaturated in surface waters regardless of temperature, wind, or biological regime, but with larger undersaturations with upwelling. Results suggest that the ocean consumes about 18 % of atmospheric CCl4. This paper studies the seasonal variation of surface and column CO at three different sites (Paris, Jungfraujoch and Wollongong), with an emphasis on establishing a link between the CO vertical distribution and the nature of CO emission sources. We find the first evidence of a time lag between surface and free tropospheric CO seasonal variations in the Northern Hemisphere. Comparison of modeled and measured peroxide concentrations at a rural site in the summer North China Plain demonstrated an underestimation during biomass burning events and an overestimation on haze days, which were related to the direct production of peroxides from biomass burning and the heterogeneous uptake of peroxides by aerosols, respectively. Our findings are of great significance for comprehensively understanding the chemical budget of atmospheric peroxides in detail. Formation of organosulfates (OSs) in secondary organic aerosol from the photooxidation of alkanes is reported from smog chamber experiments. Effects of acidity and relative humidity on OS formation were examined. Most of the OSs identified could be explained by formation of gaseous epoxide and/or hydroperoxide precursors with subsequent acid-catalyzed multiphase chemistry onto sulfate aerosol. The OSs identified here were also observed and quantified in aerosols collected in two urban areas. In this paper, for the first time, temperature longitudinal oscillations are derived from 20 to 150 km from a single instrument. A climatology of amplitudes and phases of zonal waves with odd daily frequencies is presented on a global scale. The interannual variability in amplitudes of the migrating modes shows a QBO in the MLT, which is probably originated in the stratosphere. The results are useful for testing general circulation models considering tidal effects in the MLT region. We developed a mechanistic model for estimating the emission of elemental mercury vapor (Hg0) from natural surfaces in China. The development implements recent advancements in the understanding of air–soil and air–foliage exchange of Hg0 and redox chemistry in soil and on surfaces, incorporates the effects of soil characteristics and landuse changes by agricultural activities, and is examined through a systematic set of sensitivity simulations. The phase state of ambient particles was inferred from bounce measurements conducted at a rural site in central Alabama during the SOAS campaign. The organic-dominated ambient particles are mostly in the liquid phase at summertime conditions but they turn semisolid when dried in the measurement setup. Bounce humidograms reveal that the hygroscopicity and oxidation of the particles decreases the liquefying RH. The effect of oxidation is emphasized by oxidation flow reactor measurements. The focus of this paper was to use gas-phase tracers and aerosol composition to characterize the influence of the different sources on optical extinction (RH = 22 %) and summertime visibility in the Colorado Front Range. Our analysis indicates that aerosol nitrate contributed significantly to optical extinction in agriculturally influenced air masses, while in other plumes, organics could explain most of the observed variability in optical extinction. The paper presents an inventory of black carbon (BC) emissions from diesel sources in Russia. On-road diesel vehicles emitted 21 Gg of BC in 2014; heavy-duty trucks accounted for 60 % of the on-road BC; and cars represent only 5 %. Superemitters emitted 33 % of all on-road BC. BC emissions from off-road diesel engines estimated at 28 Gg. While consuming 68 % of the diesel fuel in the country, on-road vehicles produced only 42 % of BC emissions due to introduction of emission standards. Accurate quantification of atmospheric ammonia concentration and exchange fluxes with the land surface has been a major metrological challenge. We demonstrate the applicability of a novel laser device to identify concentration and flux patterns over a peatland ecosystem influenced by nearby agricultural practices. Results help to strengthen air quality monitoring networks, lead to better understanding of ecosystem functionality and improve parameterizations in air chemistry and transport models. A new method for assessing aerosol effects on clouds is proposed. 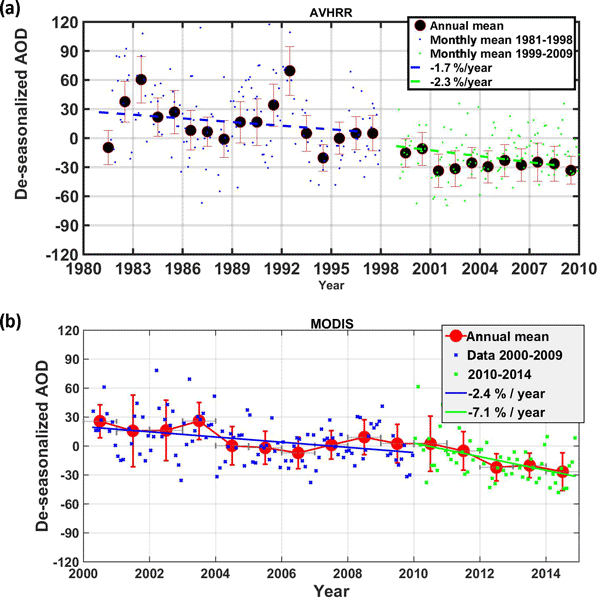 For the first time, 14 years of collocated, coincident ground-based observations have been used to study cloud–aerosol–meteorology–radiation interactions in the USA. For this site, the results indicate that the influence of the aerosol on cloud radiative effect and cloud albedo is weak, and that macroscopic cloud properties play a much larger role in determining the cloud radiative effect compared to aerosol effects. Specific physical and mineralogical properties of desert dust particles cause extremely efficient production of ice crystals in clouds, thus influencing climate and weather even in regions far from dust sources. This study describes a methodology for predicting conditions of cold cloud formation due to dust. This approach required development of an integrated dust-atmospheric modelling system, designed to improve operational forecasts of weather in general, and cloud/precipitation in particular. We calculate the qualitative behavior of precipitation response to aerosol loadings with cloud depths for warm boundary layer clouds (stratocumulus and shallow marine cumulus), using aircraft measurements across four field campaigns. The finding shows that precipitation responds similarly to aerosol loadings for both stratocumulus and cumulus clouds, regardless of cloud type. Precipitation is most susceptible to aerosol perturbations in the medium–deep depth of clouds. This study integrates high and low resolution temporal measurements to assess the impact of the Holuhraun effusive eruption in 2014 across the UK. Measurements, modelling and satellite analysis provides details on the transport and chemistry of both gases and particulates during this unique event. The results of the study can be used verify existing atmospheric chemistry models of volcano plumes in order to carry improved risk assessments for future volcanic eruptions. The formation mechanisms of sulfate in the marine boundary layer are not well understood, which could result in large uncertainties in aerosol radiative forcing. We measure the oxygen isotopic composition (Δ17O) of sulfate collected in the MBL and analyze with a global transport model. Our results suggest that 33–50 % of MBL sulfate is formed via oxidation of S(IV) by hypohalous acids HOBr / HOCl in the aqueous phase, and the daily-mean HOBr/HOCl concentrations are on the order of 0.01–0.1 ppt. Atmospheric NH3 plays an important role in forming secondary aerosols and has a direct impact on sensitive ecosystems. This study aims to study its long-term variation and find that the long-term trend can be affected by climate change as well as other anthropogenic factors, depending on sites. A large percentage increase of atmospheric NH3 at remote American sites is surprising and may cause a potential threat to sensitive ecosystems in the future.